I would like to make a baby blanket using a 3 light but the pattern calls for 4 medium yarn. The pattern for the 4 calls for size 9 needle. Would I use a smaller needle? Or, should I double strand the 3 light and use the 9 needle? to be honest I had to do a google search to find these wool weights as I am not familar with them. The 3 Light equates to an 8 ply here in Australia and the 4 Medium equates to a yarn between 10 - 12 ply. If you intend to use the 3 Light with a pattern that specifies 4 medium you would normally need to use bigger needles, especially if you wanted to match the size of your finished item to the item in the pattern. Using smaller needles would make the blanket much smaller than one made with the specified weight of yarn. 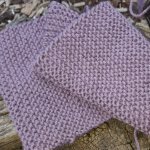 You can compensate by adding extra rows but the width of your blanket will be much narrower than intended by the person who designed the pattern. To make it the correct width you would have to add more stitches and adjust any stitch patterns used to incorporate the new (additional) stitches into the pattern(s) on the blanket. Return to Answered Knitting Questions. If this is all that you can see in this box, then you probably have an ad-blocker enabled on your browser. I know that adds can be a little annoying but the advertising on this site helps to cover the costs of running the site. If you can't or won't whitelist this site so that the adverts are visible to you, please consider making a donation using the button below. This site receives a small commission from affiliate links and third-party advertising. All images on this site have been sourced legally and copyright remains with the photographer.